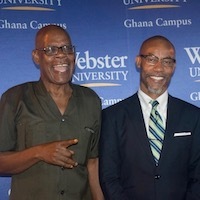 Over the past week, Webster University's campus in Accra, Ghana, hosted a series of important political discussions. The week began with a heated student forum over the distasteful comments recently made by U.S. President Donald Trump on Haiti, El Salvador and nations in Africa. Some students expressed frustration if not disbelief that the sitting U.S. president could actually label the African continent in such a negative and disparaging light, while others viewed his remarks as simply a “wake up call” for Africans to work towards a better, more positive image of Africa as a whole. The discussion was moderated by visiting faculty member, professor Jean Germain Gros, who incidentally comes from Haiti and also shared his perspective. Through the discussion, Gros also shed light on various U.S. immigration policies (including DACA) and helped students to process the wide range of feelings expressed on the now infamous comments made by Trump. well as students from other schools and the public at large. 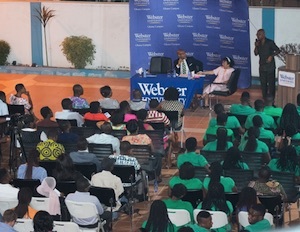 Shortly following the student forum, Webster Ghana also hosted the latest in its annual public lecture series, a panel on "The Politics and Economics of Neo-Colonialism in Post-Independent Africa." 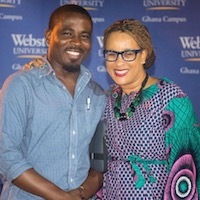 Speakers included Gros as well as Kwame Boafo-Arthur, professor of Political Science at University of Ghana, Legon and Agnes Khoo Dzisi, current head of department for International Relations, who moderated the program. During the discussion, Gros argued that in order to end the exploitation of Africa’s natural resources by its former (and potentially new) colonial rulers, African leaders must come together to build Africa-centric economies. He explained that an effective Africa-centric economy would require that Africa’s raw materials and mineral resources be processed into finished or semi-finished products in Africa rather than sold in raw, unfinished forms at low prices for the profit of corporations in the industrial north. Boafo-Arthur provided yet another perspective, emphasizing that the issue of neo-colonialism keeps regenerating itself because African leaders refuse to “think outside of the box,” preferring economic dependency over economic stability, growth and development. He entreated African leaders to contribute meaningfully during policy-making discussions with world leaders and multi-lateral international organizations. Members of the audience engaged in the discussion with the invited faculty and moderator. Participants included Webster Ghana students, academics, corporate institutions, security agencies, alumni, and the public. Students from the University of Ghana were also present in addition to high school students from Tema International High School.